Europe has a reputation around the world as a beacon of tolerance and multiculturalism, led by Merkel's welcoming of a million refugees in the last four years. But this reputation is rapidly crumbling - and Muslim women across the continent are feeling the effects. Although I am born and bred in Germany, I do not identify as a German - simply because Germans do not identify with me. Despite my professional successes and activism, my fate is as grim as my Lebanese mother's in navigating life in a country and continent rife with racism. It is only through increased visibility, vocalness and ultimately political participation that Muslim women can survive. And fortunately, the tide is beginning to turn. Although it is tragic to see Europe succumbing to its old ghosts of racism and white supremacy, there is no reason why the continent should be uniquely immune to it. The formation of the EU was primarily about solidarity and cooperation between European states, and not about expanding those values between Europe and its neighbours in Africa and the Middle East. It is historical coincidence that support for the EU (and specially Schengen) has become a left wing position, since this was originally about freedom of movement within Europe for native Europeans. This backdrop helps us understand why those same EU institutions are now being targeted by the hard - and the far - right, who want to either destroy Europe, or maintain its structures as a protectionist block. They support Europe in so far as they want to Make Europe Great Again and put Europe First. And they define Europe primarily as a negative. They know Europe mostly by what it is not: Africa or the Middle East. This may sound like a dystopia, but it is already happening. EU elections have never had the same prominence as national or even local elections, particularly among minorities and immigrant communities who can have lower democratic literacy. This has allowed the EU parliament to swing to the right. Far right groups in Brussels have 37 MEPs, using their platform to hammer a range of targets. At the top of their hit list is Muslims in general, and Muslim women in particular. And there has been very little response from many of the traditional national parties. Perhaps knowing that the Muslim vote was beyond their reach, ballot box realpolitik meant that there was little cost to them looking the other way. And Muslims themselves are barely represented in Brussels: there are only 3 Muslim MEPs out of a total of 751. And since they are all men, Muslim women are invisible in the EU parliament (with the exception of some of the cleaners). If this trend is allowed to continue, it will get worse, not better: right wing blocs are planning on using May’s EU Elections to move Brussels even further right. This may not affect the life of many “native” Europeans, but those with an immigrant background - and especially Muslim women - will likely pay the price with their relationships, behaviour, clothes and even their thoughts being policed in an increasingly hostile climate. Muslim women must accept part of the responsibility for this. As a population, European Muslim women have historically been some of the least politically active citizens. And as mainstream political parties have at best used them tokenistically and at worst shunned them entirely, this has become entrenched. But things are beginning to change. In my political party, for example, my immigrant Muslim background is the norm, not an anomaly. My fellow candidates’ families hail from Turkey, North Africa, the Balkans and Africa. And many of them are women. Just as the far right have quietly built their support base into seats in Brussels, I hope we will be able to do the same in our communities, many of whose members have never voted. And next time Muslim women are mentioned at the EU parliament, I hope there will be someone to talk back. 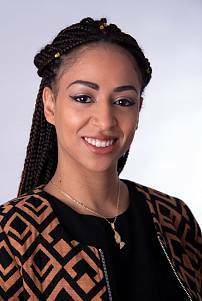 Maha Walter-Kamano is a German activist, whose parents moved to Bonn from Lebanon and Guinea. She is an EU Parliamentary candidate for BIG Partei (Bündnis für Innovation und Gerechtigkeit), a grassroots political party founded by Germans with an immigrant background.